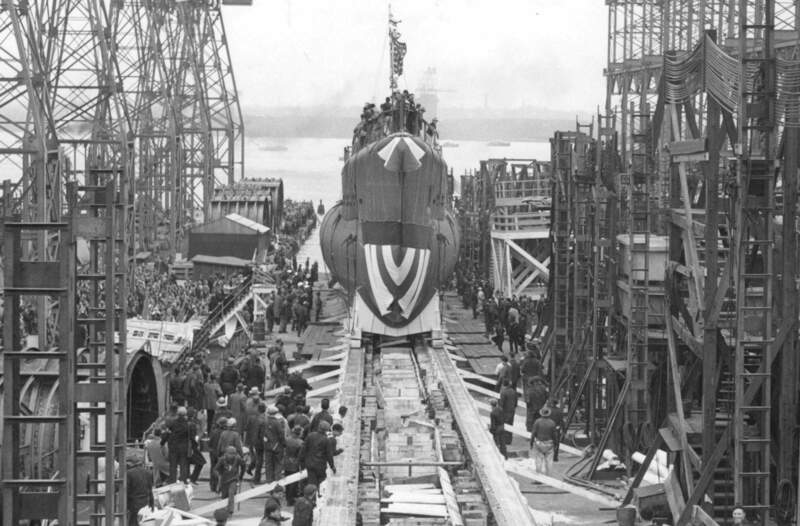 Balao Class Submarine: Laid down, 10 June 1942, at Cramp Shipbuilding Co., Philadelphia, PA.; Launched, 18 April 1943; Commissioned USS Escolar (SS-294), 2 June 1944; Sunk on 1st patrol, depth charged by Japanese Frigate (kaibokan) CD-38 & Patrol Boat 102 (ex-USS Stewart, DD-224) on 19 October 1944, in Yellow Sea, all hands lost; Struck from the Naval Register, (date unknown). 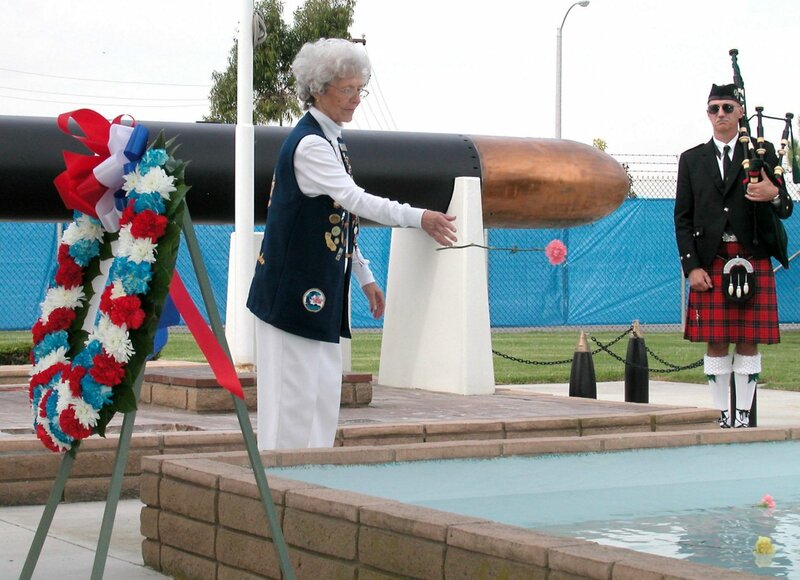 107k Mrs. J. Bilisoly Hudgins makes an impact on Escolar's (SS-294) bow with a bottle of champagne. Photo by Harry L. Raynore, courtesy of digital.library.temple.edu. 114k A good view of the prop and rudder area of the Escolar (SS-294). 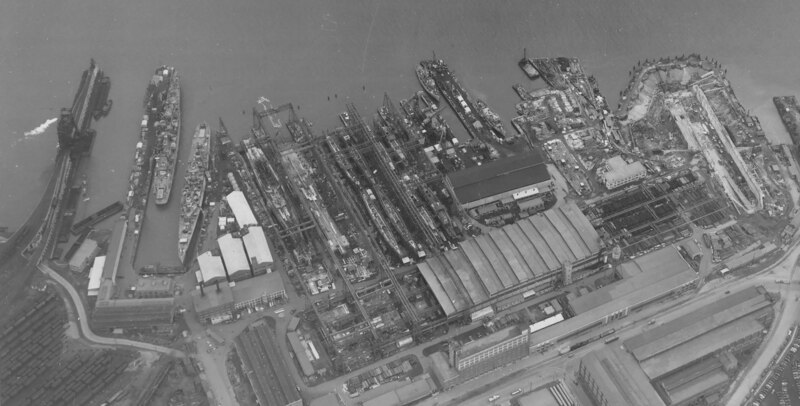 The stern planes are being held in position by temporary supports during this construction photo taken at Cramp Shipbuilding Co., Philadelphia, PA. in April 1943. Metal still needed to be fitted around the torpedo tubes and the lower outer door. USN photo # 19-N-437637. 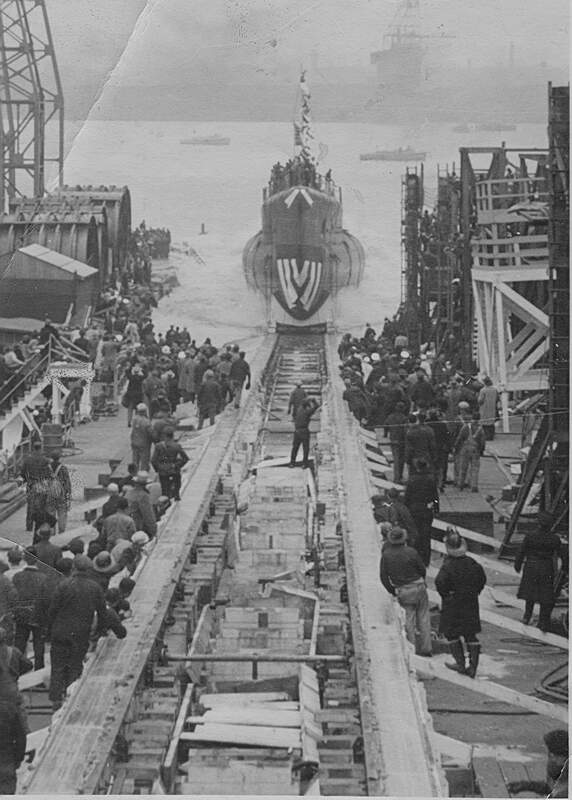 851k Escolar (SS-294), at Cramp Shipbuilding Co., Philadelphia, PA. on the launching blocks moments before she starts her slide down the ways, 18 April 1943. USN photo courtesy of Claude Hill, whose father, Engineering Officer Lt. Claude J. Hill, was K.I.A. with the Escolar (SS-294) and her entire crew of 82. 728k Escolar (SS-294) sliding down the ways, 18 April 1943. USN photo # 80-G77167,courtesy of Scott Koen & ussnewyork.com. 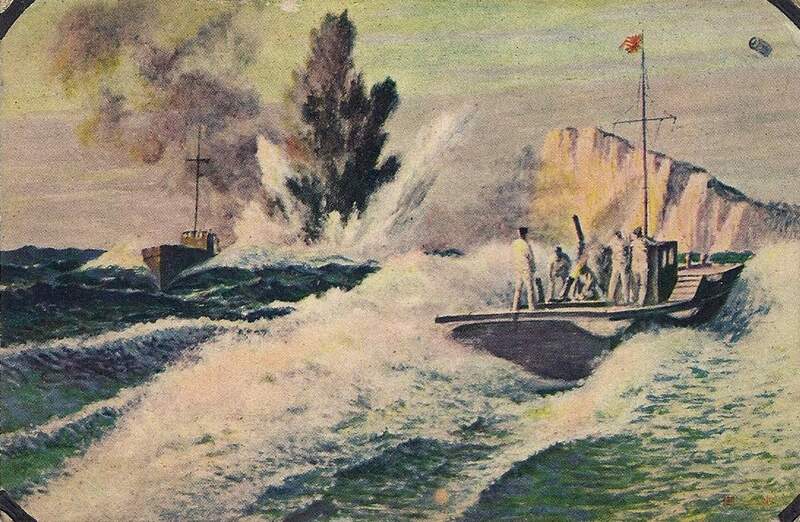 1.20k Escolar (SS-294) down the ways and into the waters of the Delawere River on 18 April 1943. Photo courtesy of Ric Hedman. 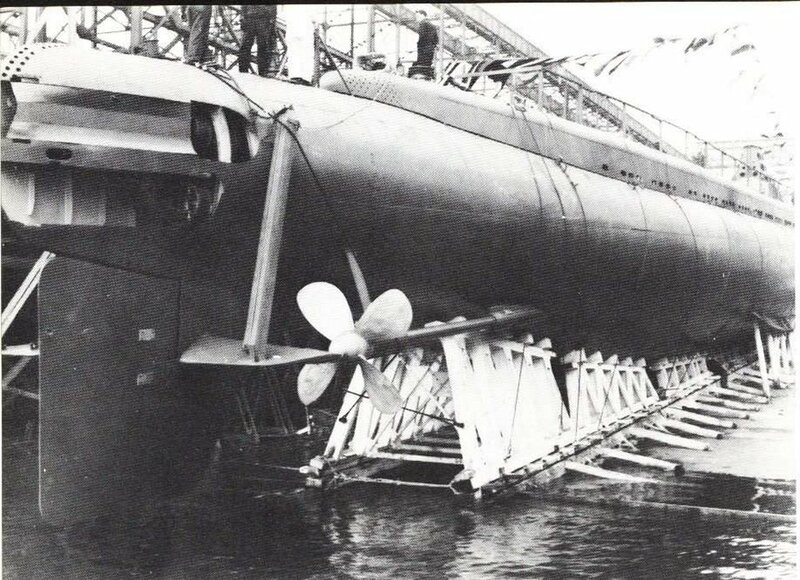 148k Most likely on the Delaware River off Cramp Shipbuilding Co., Philadelphia, PA. 18 April 1943, Escolar (SS-294) has what appears to be a number of civillian technicians on board observing her first movements. USN photo courtesy of Ronald Norford, whose brother, Robert Nelson Norford, F1/C, USNR, was K.I.A. with the Escolar (SS-294) and her entire crew of 82. Sitting L to R: 2-Krause SM 1/c, (Note: Krause had originally served on the Wahoo (SS-238) and had transferred stateside to be with his family) 3-Boesel S 1/c, 4-Killough MM 1/c, 5-Smith, A.R., S 1/c, 6-Norford F 1/c, 7-Newton TM 1/c, 8-Miller EM 1/c, 9-Wallace TM 2/c, 10-Tocharcheck GM 1/c, 11-Hampton QM 1/c, 12-Jones MA 2/c, 16-Cifrodella TM 2/c, 17-Turner EM 3/c, 18-Caldwell TM 1/c. 2nd row L to R: 4-Gancarz EM 2/c, 6-Michaud CTM, 7-Gorecki CCS, 8-Johnson C PHM, 9-Davis CEM, 10-Pennington CMM, 13-Patterson S 2/c, & 13-LaRoe S 2/c. 3rd row L to R: 1-Ennis S 2/c, 4-Slavik F 2/c, 5-Fulton MM 1/c, 7-Smith, B.T. F 2/C, 8-Brouskie EM 1/c, 12-Bonk S 1/c, 13-Parrish TM 3/c, 14-Valentino MM 2/c & 16-Patrou TM 3/c. 4th row L to R: 1-Hahn S 2/c, 4-Wybrow SC 3/c, 5-Bailey EM 1/c, 7-Munsel MoMM 3/c, 8-Cahill MoMM 3/c, 9-Tucker S 1/c, 10-Campbell RM 1/c, 11-Lieder MM 1/c, 14-McConnell S 1/C & 16-Fostair QM 2/c. USN photo courtesy of Ronald Norford, whose brother, Robert Nelson Norford, F1/C, USNR, was K.I.A. with the Escolar (SS-294) and her entire crew of 82. 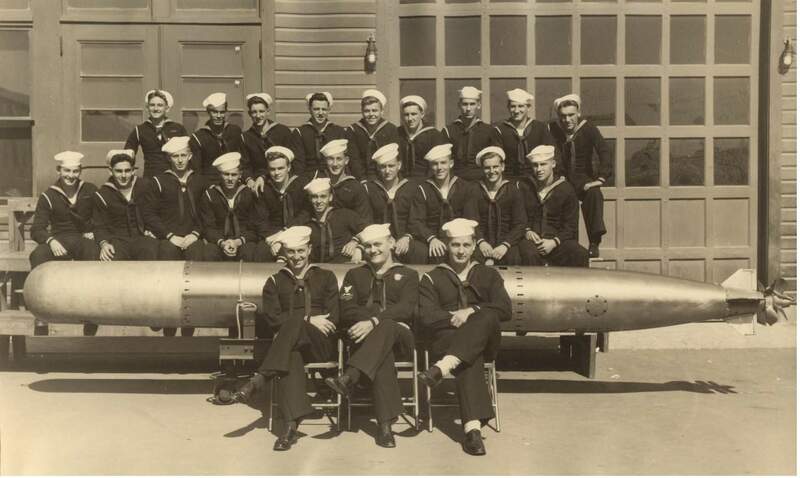 117k Escolar (SS-294) torpedoman Charles Yaworsky, W. TM3 is pictured in the second row, second person on the right hand side behind the torpedo at the Naval Training School at Newport, CT.
USN photo courtesy of csp.navy.mil. Well, in taking a look at the uniform, it is the aviation officer working greens. 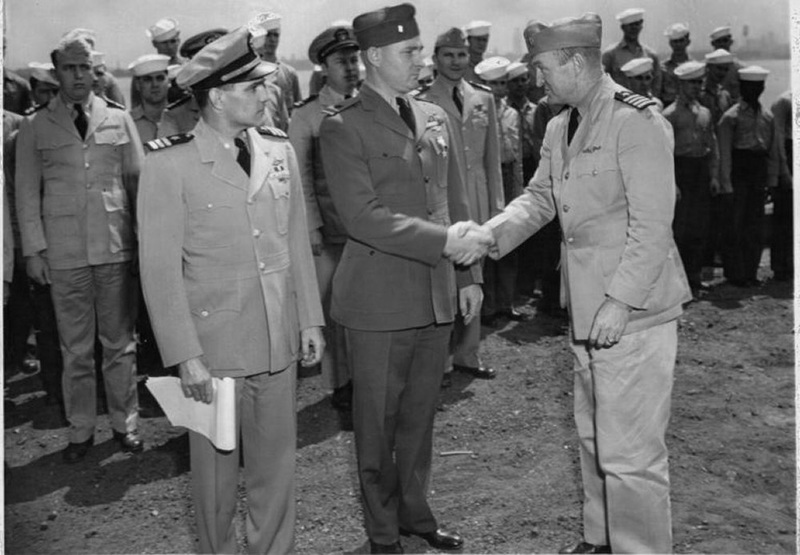 The officer is an ensign, and has just been awarded what looks like the Silver Star (or possibly the Bronze Star). He also has several other ribbons/medals, and appears to have some sort of warfare badge just below the ribbons (it looks like wings), and possibly another badge above the ribbons. I am normally bad at guessing ages, but this guy looks considerably older than the typical 23 year old naval aviation officer program graduate. He was some sort of liaison officer temporarily assigned to the Escolar for training purposes. He might have been facilitating communications with the aviation forces, or was engaging in some cross type training for familiarization (maybe a airship pilot seeing how subs operate). I remember reading somewhere that this had been done on a few occasions in the Pacific, mostly to coordinate with the carrier forces for lifeguard duty. Obviously since the Escolar hadn't yet conducted a war patrol this probably isn't the case, but it may have been a precursor to this. 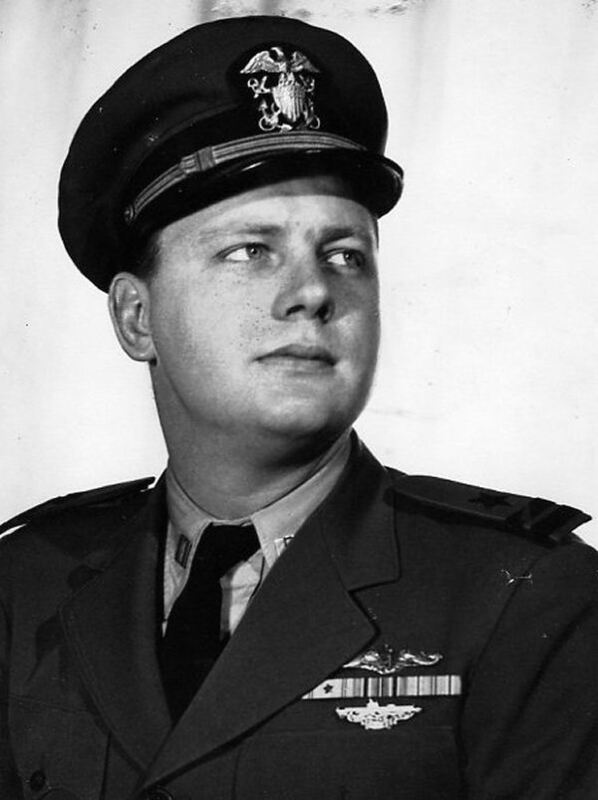 He was a former enlisted man from the aviation branch who received a commission, and either voluntarily or involuntarily was transferred to submarines once he received his commission. This would explain the "advanced" age with a low rank. 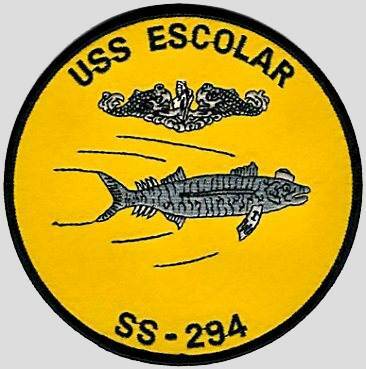 The Silver Star may have been earned on a combat mission while an enlisted man and was only just awarded upon his arrival to the Escolar after sub school. As an enlisted man he may have been a crew member on a PBY Catalina or similar. He put in for or received a commission and was approved, only to find out afterward that he was being transferred to subs. I freely admit that these are all long shots, with a hell of a lot of old fashioned informed speculation weighing in. This combination is so unlikely that it really piqued my interest and I would love to know if anyone can fully explain it. Subsequently, according to the info from the book "The U.S. Navy in World War II" by Mark Henry (Osprey Publishing); Apparently, in the spring of 1943 the navy felt it needed a new uniform that blended in better with the background aboard ship. They also intended that oil and dirt stains be less noticeable, a real problem on whites and khakis. So they introduced a slate grey version of the khakis with black buttons. It was to be worn with a light grey shirt. Overall, it was virtually the same as the aviation greens, just a different color, making the two hard to distinguish in a black and white photo. The new uniform was authorized in May, 1943 and phased in slowly. Unfortunately for the Navy, it was universally hated by the sailors. Very few officers purchased and wore it, the enlisted version was even rarer and was virtually unknown. Apparently it "just wasn't Navy". It managed to hold on until 1947 when it was officially disestablished. In addition to the ensign in the award photos (which I still think is a former enlisted man), several of the officers in the later commissioning party photos are wearing the grey uniform. One photo even shows two chiefs wearing the ultra rare enlisted version. Maybe Moke Milligan became one of the few fans of the uniform after seeing it on the ensign and "encouraged" his crew to wear it. Whatever the reason, this makes these photos quite special. Photo I.D. & text courtesy of John Hummel, Dave Johnston.& Darryl L. Baker. USN photo courtesy of Ronald Norford, whose brother, Robert Nelson Norford, F1/C, USNR, was K.I.A. with the Escolar (SS-294) and her entire crew of 82. 125k Awards ceremony for the officers and crew of the Escolar (SS-294), 3 May 1944, probably in Philadelphia. 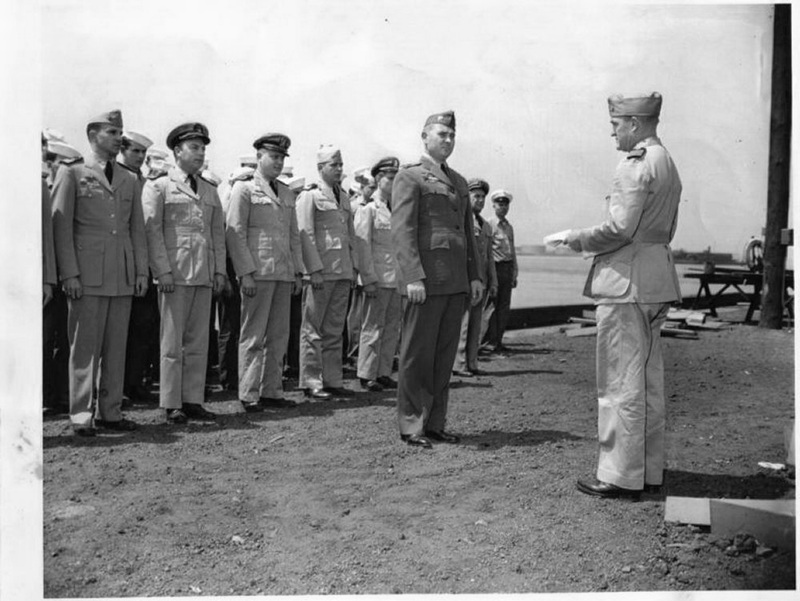 199k Awards ceremony for the officers and crew of the Escolar (SS-294), 3 May 1944, probably in Philadelphia. Cdr. William J. Millican is congratulating the officer receiving the award. 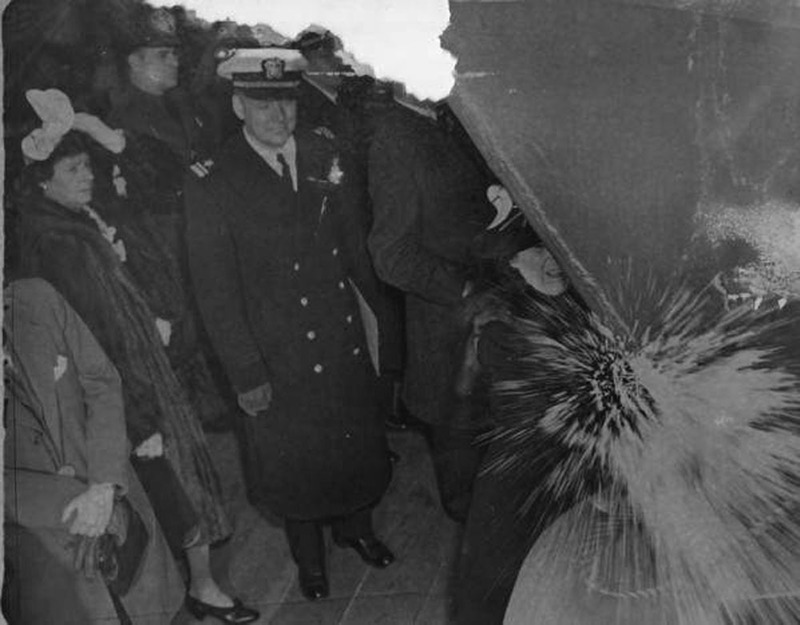 The officer on the right margin of the photo is the Engineering Officer, Lt. Claude J. Hill. USN photo courtesy of Ronald Norford, whose brother, Robert Nelson Norford, F1/C, USNR, was K.I.A. with the Escolar (SS-294) and her entire crew of 82. 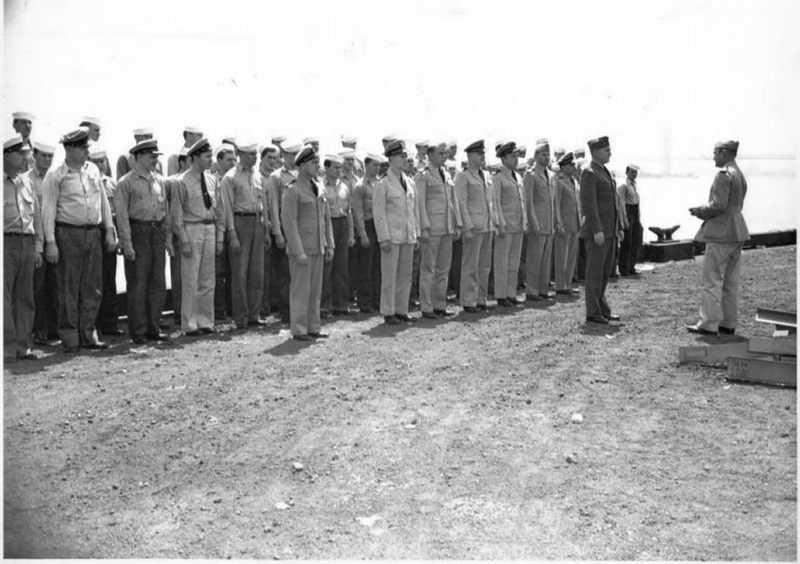 113k Awards ceremony for the officers and crew of the Escolar (SS-294), 3 May 1944, probably in Philadelphia. Cdr. William J. Millican is holding a tablet of paper next to the officer receiving an award. Robert Nelson Norford, F1/C, is the third person on the right, first row. Text i.d. courtesy of John Hummel, USN (Retired). USN photo courtesy of Ronald Norford, whose brother, Robert Nelson Norford, F1/C, USNR, was K.I.A. with the Escolar (SS-294) and her entire crew of 82. 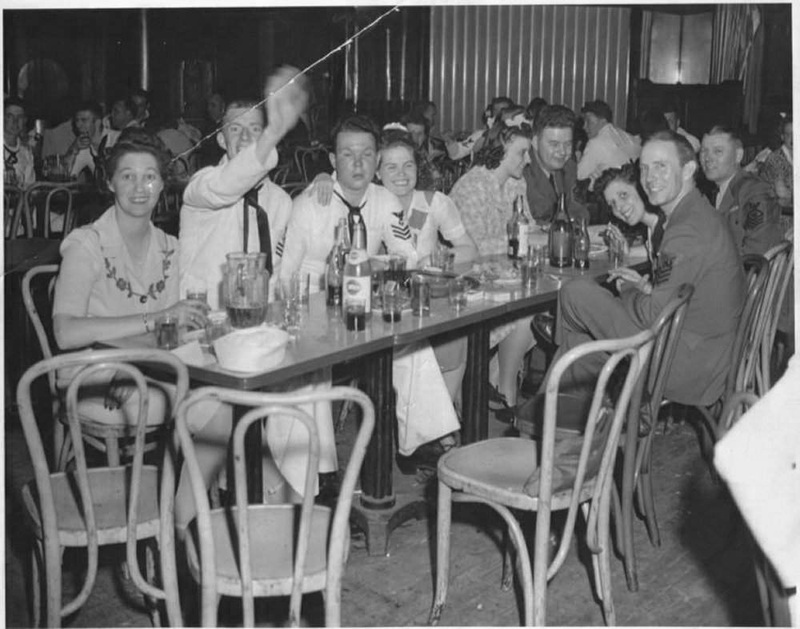 120k Commissioning party for the crew of the Escolar (SS-294), 19 May 1944, probably in Portsmouth, N.H.
Cdr. William J. Millican is on the extreme left on the first row. Robert Nelson Norford, F1/C, USNR, is at the top row, right. USN photo courtesy of Ronald Norford, whose brother, Robert Nelson Norford, F1/C, USNR, was K.I.A. with the Escolar (SS-294) and her entire crew of 82. 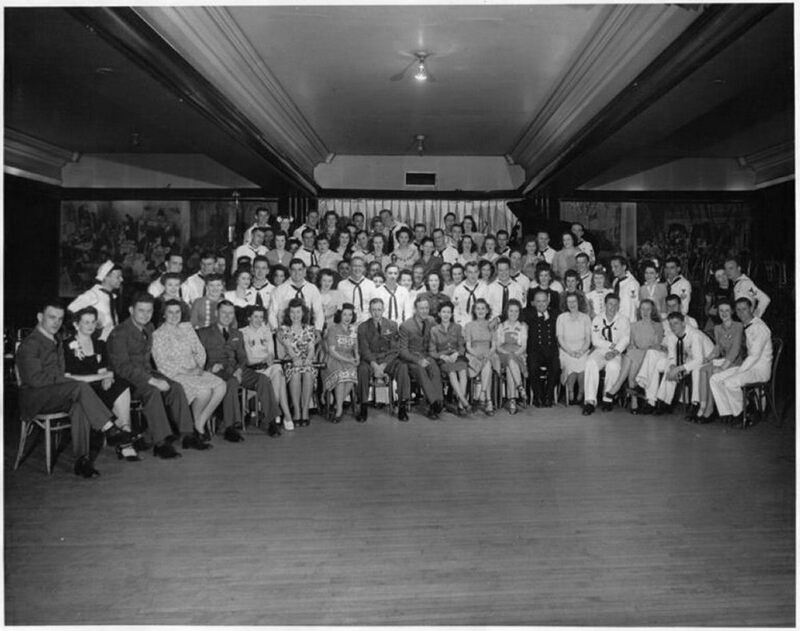 79k Commissioning party for the officers and crew of the Escolar (SS-294), 19 May 1944, probably in Portsmouth, N.H. Robert Nelson Norford, F1/C, USNR, is seated in the left hand corner of the photo. 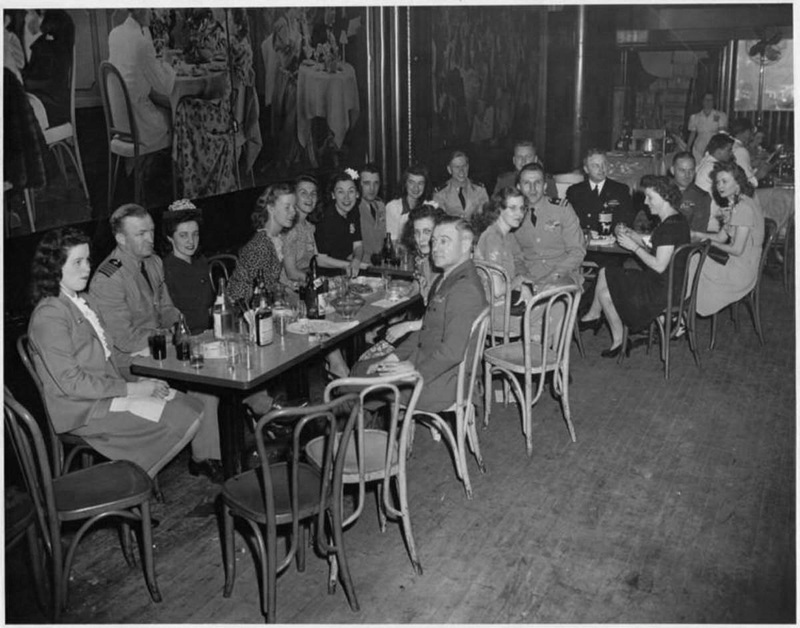 108k Commissioning party for the officers and crew of the Escolar (SS-294), 19 May 1944, probably in Portsmouth, N.H.
Cdr. 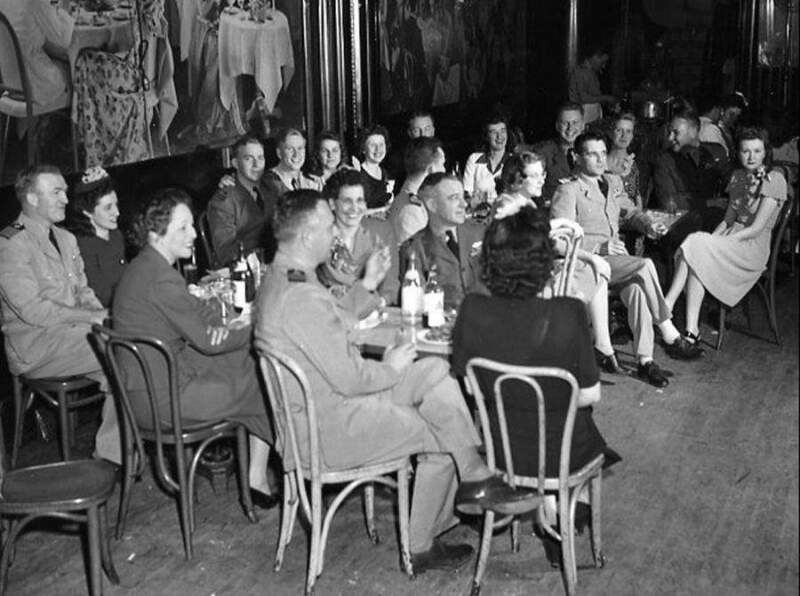 William J. Millican is the 7th person seated against the wall, between the two ladies. The wife of Engineering Officer, Lt. Claude J. Hill, Mildred Carlisle Herndon Hill, is the blonde in the polkadot ruffled collar dress, 4th from the left. USN photo courtesy of Ronald Norford, whose brother, Robert Nelson Norford, F1/C, USNR, was lost on the Escolar (SS-294). Photo i.d. courtesy of Claude Hill, whose father, Engineering Officer Lt. Claude J. Hill, was K.I.A. with the Escolar (SS-294) and her entire crew of 82. 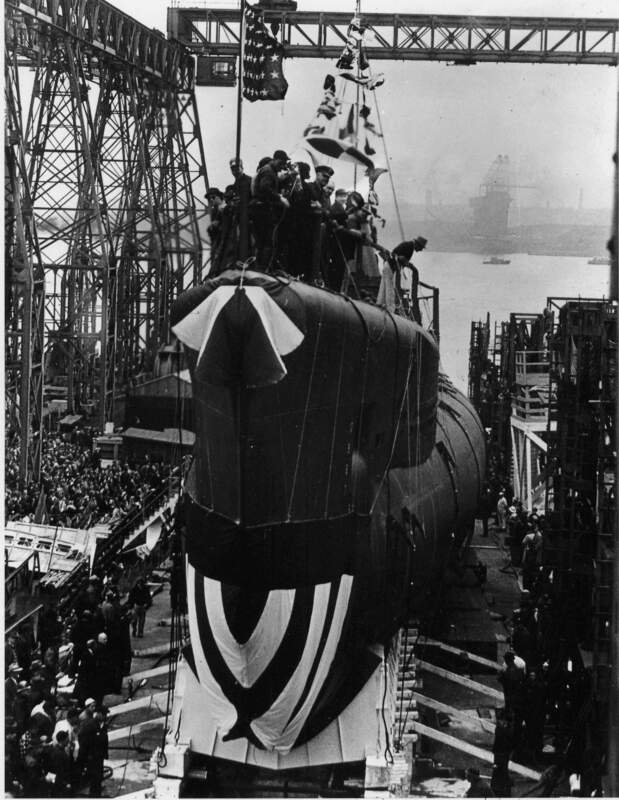 82k Commissioning party for the officers and crew of the Escolar (SS-294), 19 May 1944, probably in Portsmouth, N.H. The Engineering Officer, Lt. Claude J. Hill & his wife, Mildred Carlisle Herndon Hill, (7 months pregnant), is sitting on his right in the right upper corner. Cdr. William J. Millican is sitting immediately in front of them with his legs crossed. USN photo courtesy of Claude Hill, whose father, Engineering Officer Lt. Claude J. Hill, was K.I.A. with the Escolar (SS-294) and her entire crew of 82. 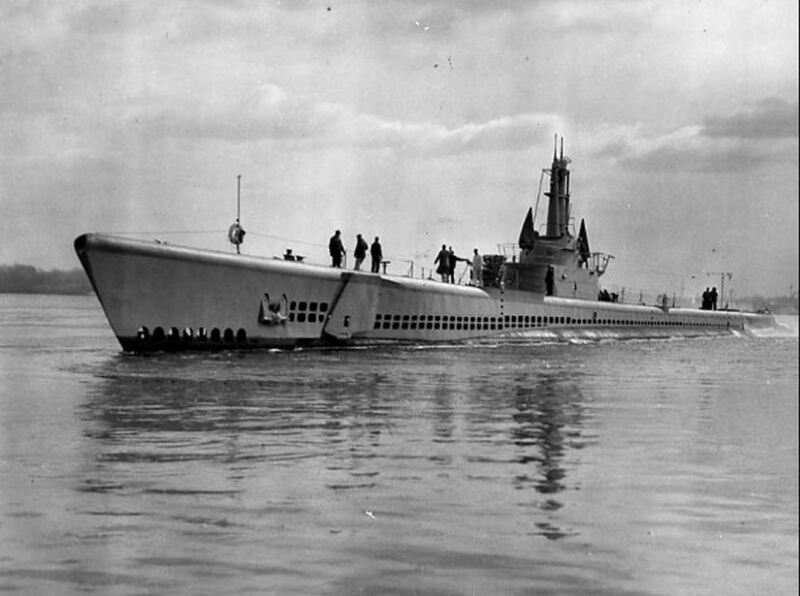 51k Escolar's (SS-294) Engineering Officer, Lt. Claude J. Hill, 1944. USN photo courtesy of Claude Hill, whose father, Engineering Officer Lt. Claude J. Hill, was K.I.A. with the Escolar (SS-294) and her entire crew of 82. 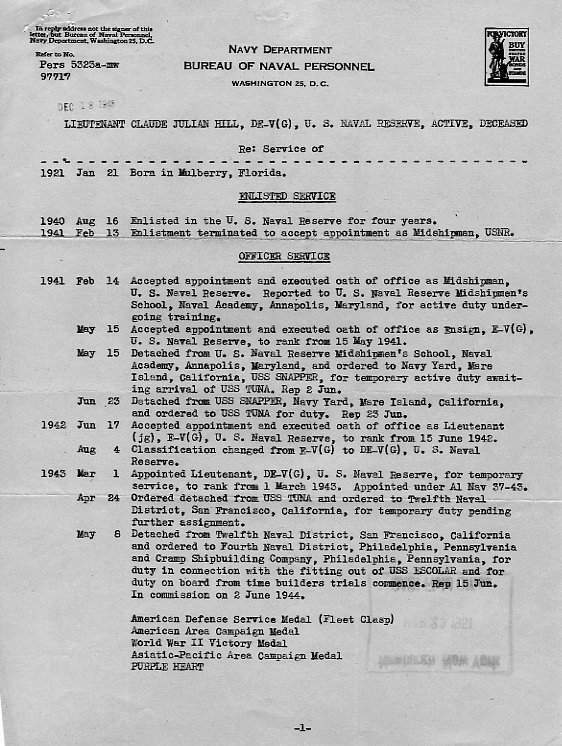 78k Page 1 of the service record of Escolar's (SS-294) Engineering Officer, Lt. Claude J. Hill, 1945. 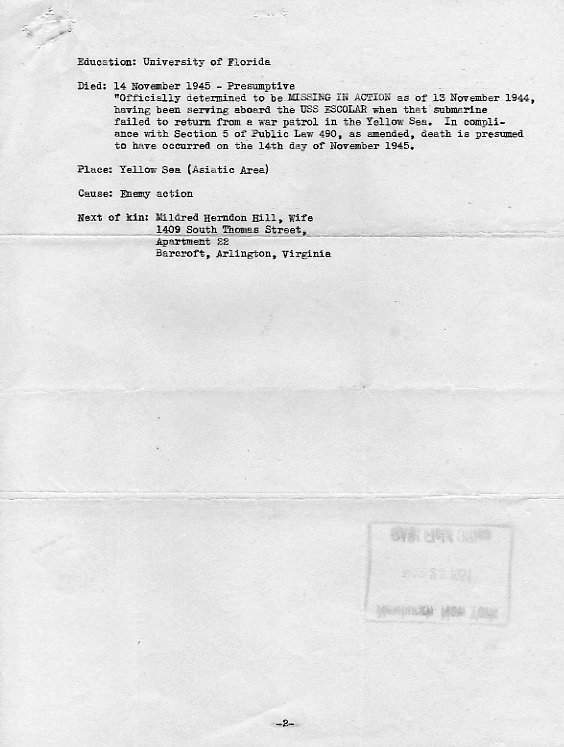 36k Page 2 of the service record of Escolar's (SS-294) Engineering Officer, Lt. Claude J. Hill, 1945. 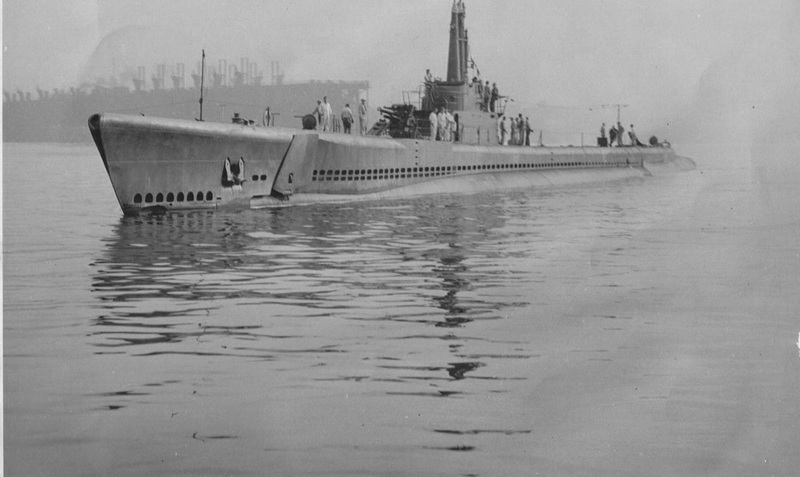 71k Official USN photo of the Escolar (SS-294), probably off Portsmouth, N.H., possibly around the time of her commissioning, circa June 1944. 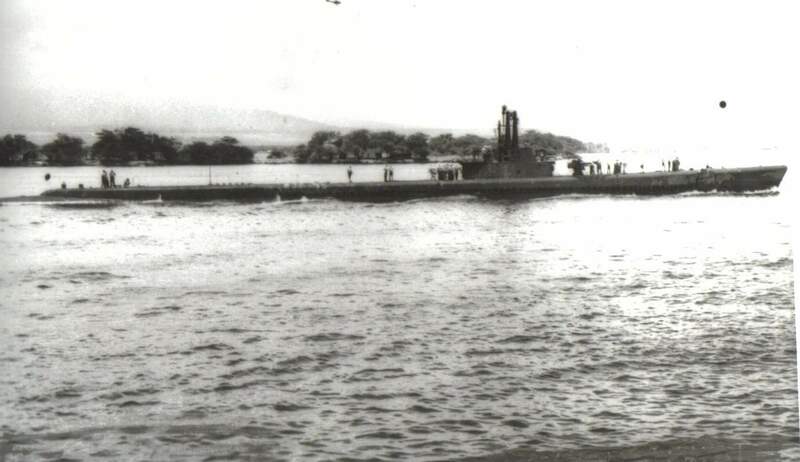 169k Escolar (SS-294), underway, starboard side view while undergoing her final training for combat at Pearl Harbor, September 1944. USN photo courtesy of Ronald Norford, whose brother, Robert Nelson Norford, F1/C, USNR, was K.I.A. with the Escolar (SS-294) and her entire crew of 82. 169k Robert Nelson Norford, F1/C, USNR, , who was lost on the Escolar (SS-294). Enlisting in March 1943, shortly after his 17th birthday. 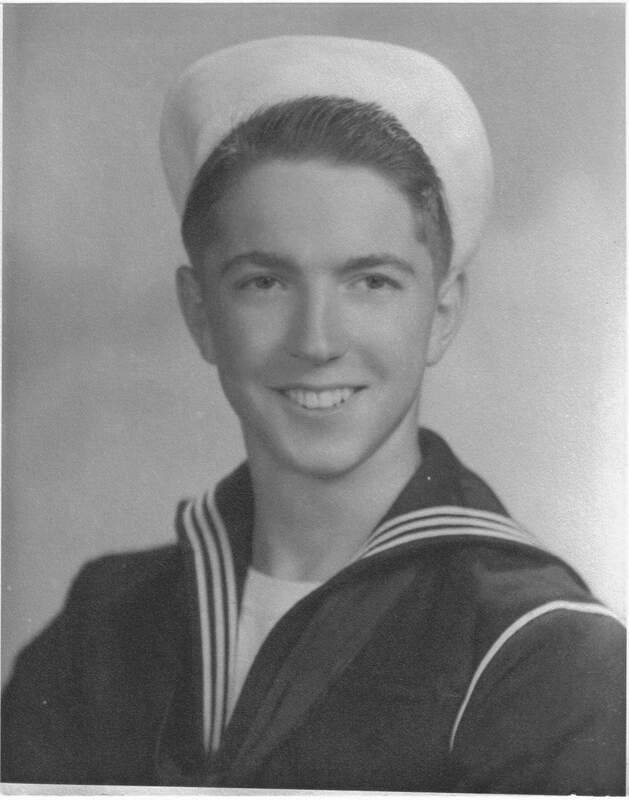 He worked at the Hagerstown Maryland ACME before enlisting in the Navy and completing sub school at New London, CT. USN photo courtesy of Ronald Norford, whose brother, Robert Nelson Norford, F1/C, USNR, was K.I.A. with the Escolar (SS-294) and her entire crew of 82. 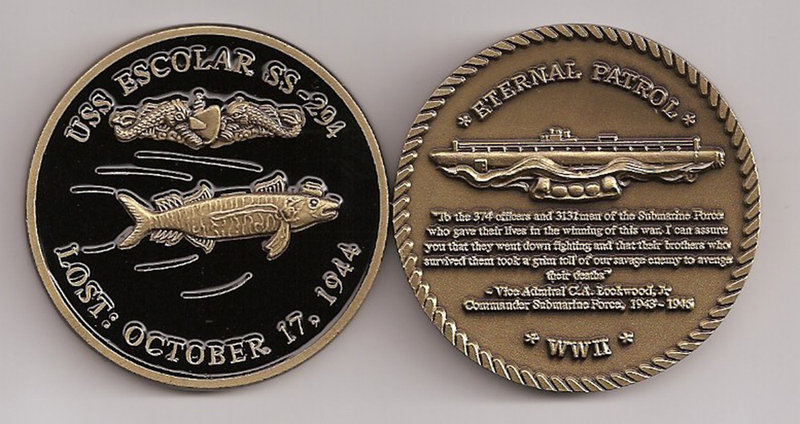 320k Escolar (SS-294) Submarine Challenge Coin. Photo courtesy of ebay.com. 1.03k Japanese Patrol Boats depth charge American submarine. Photo courtesy of Arnold Putnam. PDF translation courtesy of Kiyotaka Asano via Yutaka Iwasaki, Bruce Abele & Brad Pearson. 785k Summation of Escolar's (SS-294) loss. PDFs written by Anthony Duda & Yutaka Iwasak. 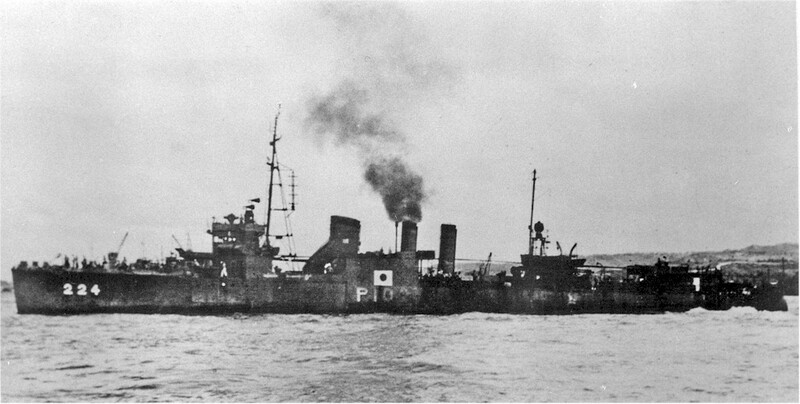 580k Imperial Japanese Navy Patrol Boat 102 (ex-Stewart, DD-224) at Kure, on 12 March 1945. She appears here after being recaptured. She was also part of the screen of the convoy MI-23 that the Tang (SS-306) would met 6 days after the Escolar's (SS-294) sinking and would also be lost. P 102's action report appears here. 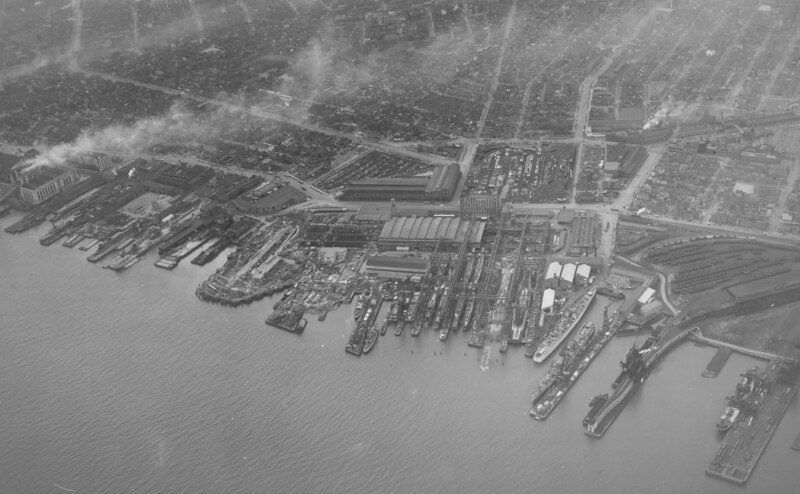 Photo by Kure Naval Arsenal, Imperial Japanese Navy via Robert Hurst courtesy of Fred Willshaw. PDF courtesy of Yutaka Iwasaki. 117k This painting is offered as a hypothesis and not presented as THE ANSWER for the Escolar's (SS-294) demise. Drawing courtesy of Ben Kennedy. 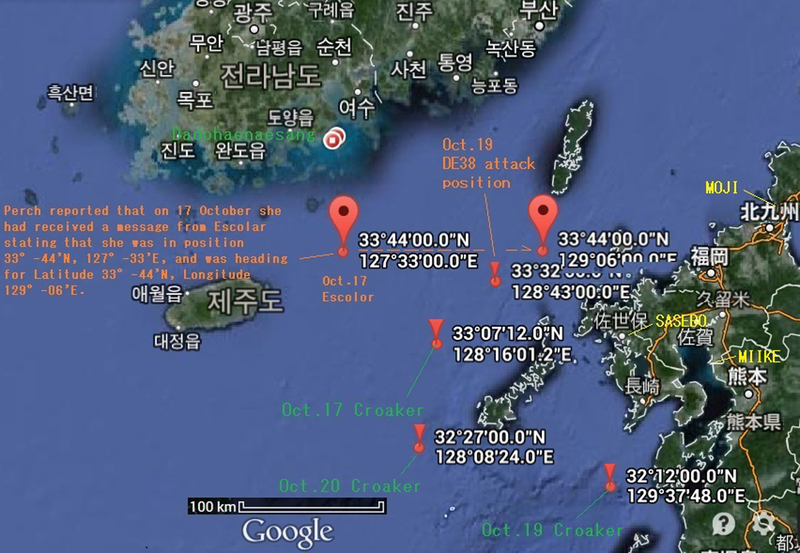 679k Google Earth satellite photo where Escolar (SS-294) is assumed to have been lost. Photo courtesy of Google Earth via Yutaka Iwasaki. 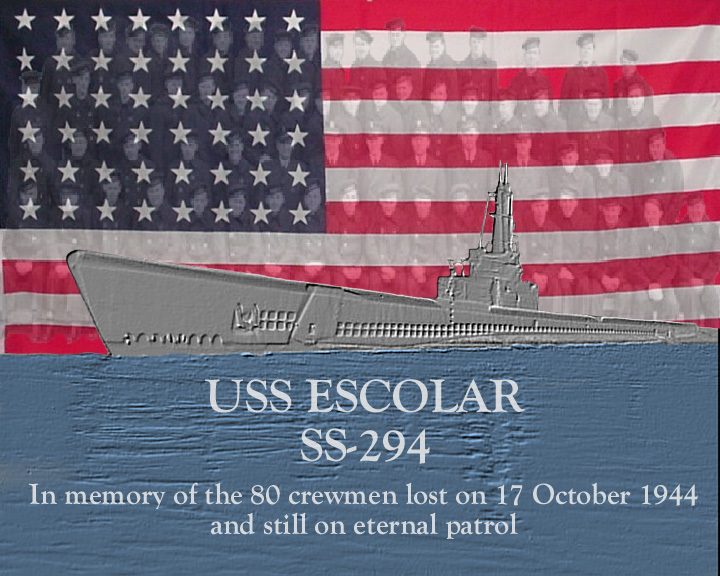 166k Commemorative photo in honor of the memory of the crew of the Escolar (SS-294). Photo courtesy of Tom Kermen. Dante's Prayer courtesy of Loreena McKennitt via quinlanroad.com. 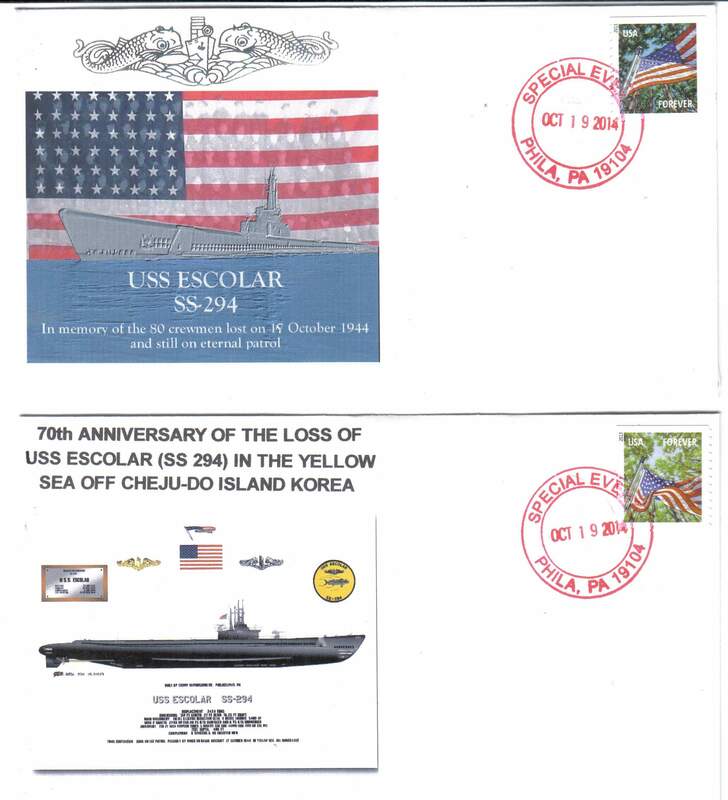 383k Commemorative photo in honor of the crew of the Escolar (SS-294). Photo courtesy of Ron Reeves (of blessed memory). 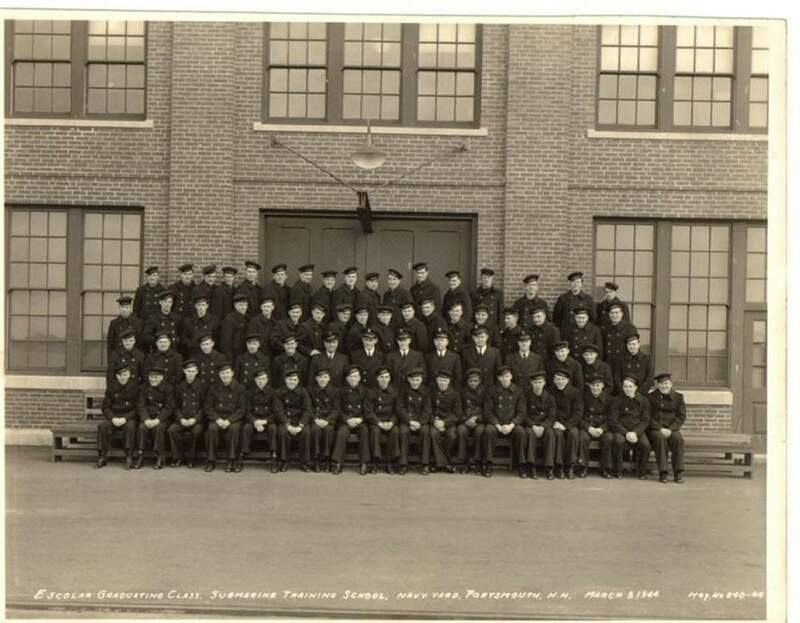 300k The crew of the Escolar (SS-294) pose for a group shot, probably at the Philadelphia Navy Yard prior to commissioning, circa April 1944, about six months before they were all K.I.A. Cdr. William J. Millican is on the extreme right on the first row. His XO, LCDR Frank Blaha, I think, is the first officer on the left side. 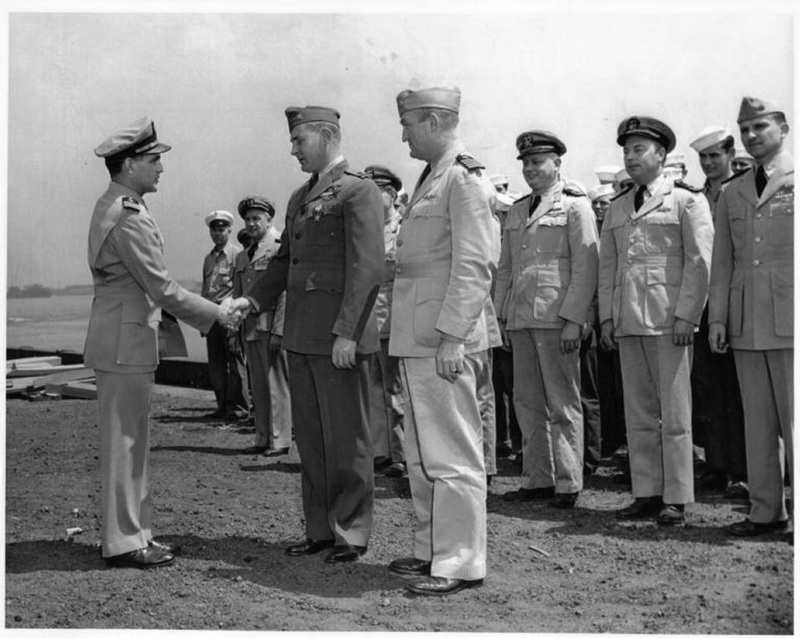 The Engineering Officer, Lt. Claude J. Hill is standing next to Cdr. Millican. 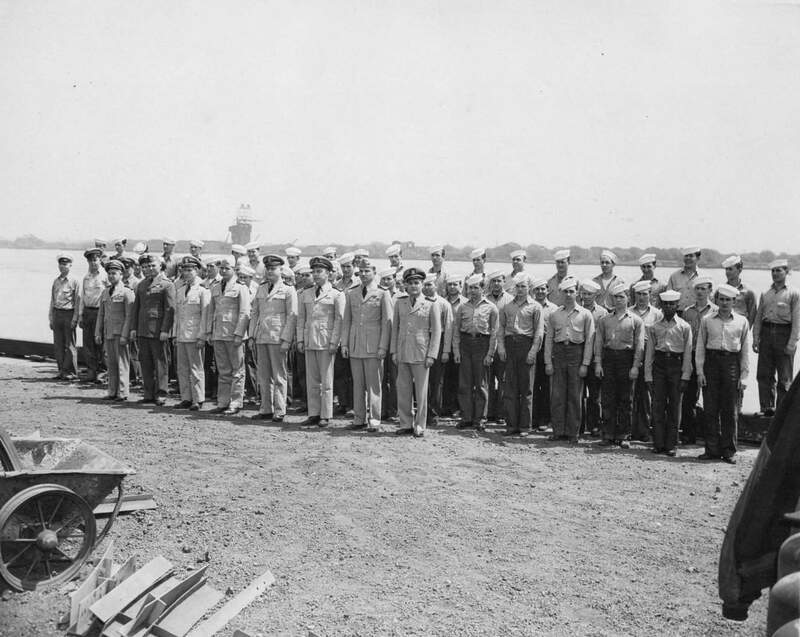 Robert Nelson Norford, F1/C, USNR, is standing in the second row, third from the right. "When the waves of death compassed me / the floods of ungodly men made me afraid; / the bonds of She'ol encircled me; / the snares of death took me by surprise; / in my distress I called upon the Lord, / and cried to my G-D: / and he heard my voice out of his temple, / and my cry entered into his ears. / Then the earth shook and trembled; /the foundations of heaven moved / and shook because of his anger /...the heavy mass of waters, and thick clouds of the skies /... And the channels of the sea appeared, / the foundations of the world were laid bare, / at the rebuking of the Lord, at the blast at the breath of his nostrils. / He sent from above, he took me; / he drew me out of many waters; / he delivered me from my strong enemy, and from those who hated me; for they were too strong for me. / They surprised me in the day of my calamity: / but the Lord was my stay / He brought me forth also into a large place: / he delivered me because he delighted in me./" Courtesy of Ronald Norford, whose brother, Robert Nelson Norford, F1/C, USNR, was K.I.A. with the Escolar (SS-294) and her entire crew of 82.